This may well be my favorite baby bootie. Tania calls them SAPATINHOS “KRIOLUKI” . Although her pattern is written in her native Portugese, I believe Tania is correct when she states (in flawless English) that anyone who knows how to crochet can follow her instructions. Actually, it’s the pictures that tell the whole story. They are cute and easy to make. Here’s another pair I think are cute. These seem a bit prissy – but could easily be made less so by a change in color. One of my favorite things for baby’s feet aren’t actually booties – they’re socks, although the designer calls them Knee High Booties. 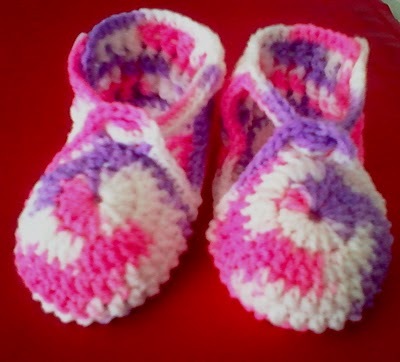 They are remarkably easy to make, despite my ‘rule’ to never crochet two things that MUST match! Dot Matthews offers her free pattern for them here .I’ve made a bundle of these for boys and girls. They work up really well in the baby jacquard type self striping yarns. You can also adjust the size up for an older child by using a larger hook and just making them longer. I really feel flatered as I see you posted my booties on your lovely blog. oi eu queria que vc me ensinase a fazer estes sapatinhos quanto vc cobra para mi ensinsnão tem como de graça me responde? I apologize that I cannot understand your question. I only understand that it’s about booties and that you’d like a reply. Wish I could help you. does anyone have the english translation for the first pattern? Have you tried working on these with the designers diagram? Also, email her for help. She’s really responsive and should be able to help it you get in a bind.